Want to learn about how Classical studies can pay for college? Click on ‘scholarships and awards’ at the top of the Ohio Classical Conference website for links to Latin scholarships both in Ohio and outside Ohio. Sterg Lazos, a Latin teacher at St. Edward, has compiled this list of ways that Latin can earn you fame and fortune. Caroline Nielsen Award in Classics: Given to a junior or senior in the university (not necessarily a classics major!) who is knowledgable about and interested in classics. CWRU also offers a group acting contest for high school students, for which there are prizes. Semple Scholarship: a special program for classics students which pays most (if not all) of tuition. Castellano Scholarship: a 4 year, full tuition scholarship for incoming freshman who have studied Latin and intend to major in Classical Languages. *Also home to the American Classical League offices. David J. Neustadt Scholarship Fund in Greek and Latin: given to an undergraduate student studying Latin or Greek. Rebecca Lucile Cornetet Scholarship: merit-based scholarship support to outstanding majors in Greek or Latin, with preference for students of Latin. OSU also offers specific classics scholarships for study abroad, graduate students, and papers. Check those out here. Both scholarships are open to all classics majors. Amounts are usually between $500 and $1,000. The NJCL Latin Honor Society offers the Anne B. Covington National Latin Honor Society Scholarship for the amount of $2000. Click here to learn more about this scholarship. The National Latin Exam offers scholarships for academic achievement. Click here to learn more about ways to earn scholarships through the exam. This article demonstrates the real value of a Humanities major. You will be surprised how many famous & successful people studied Latin. 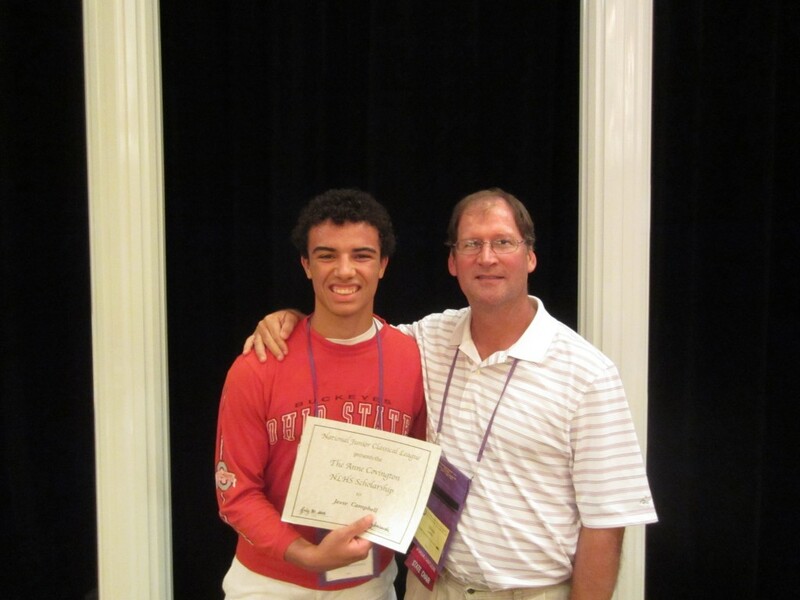 Jesse Campbell ’15, recipient of the Anne B. Covington NLHS Scholarship, and his teacher, Larry Dean.